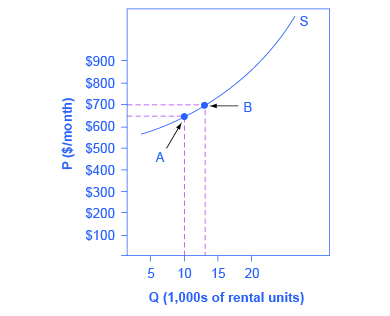 The price elasticity of supply measures how much quantity supplied changes in response to a change in the price. The calculations and interpretations are analogous to those we explained above for the price elasticity of demand. The only difference is we are looking at how producers respond to a change in the price instead of how consumers respond. Price elasticity of supply is the percentage change in the quantity of a good or service supplied divided by the percentage change in the price. Since this elasticity is measured along the supply curve, the law of supply holds, and thus price elasticities of supply are always positive numbers. We describe supply elasticities as elastic, unitary elastic and inelastic, depending on whether the measured elasticity is greater than, equal to, or less than one. Assume that an apartment rents for $650 per month and at that price 10,000 units are offered for rent, as shown in Figure 2, below. When the price increases to $700 per month, 13,000 units are offered for rent. By what percentage does apartment supply increase? What is the price sensitivity? Again, as with the elasticity of demand, the elasticity of supply is not followed by any units. Elasticity is a ratio of one percentage change to another percentage change—nothing more—and is read as an absolute value. In this case, a 1% rise in price causes an increase in quantity supplied of 3.5%. Since 3.5 is greater than 1, this means that the percentage change in quantity supplied will be greater than a 1% price change. If you’re starting to wonder if the concept of slope fits into this calculation, read on for clarification. Watch this video to see a real-world application of price elasticity.